BCW manufactures made-to-order, custom tow bars and tow dollies for companies servicing mass transit and aviation industries. Our towing equipment is made to order according to your custom specifications and comes with a money-back guarantee. BCW’s unique universal bus tow bar Model UTB-1000 is designed for fast, damage-free service and fits almost all fleet transit coaches. There is no front-end lifting and as such this eliminates the damage to windshields and front-end panels. A problem that can amount to thousands of dollars may be incurred during the towing operation. A second tow truck operator is not necessary. This minimizes labor cost to transit agencies when retrieving coaches from the highways. The tow bar unit can be put in service in minutes eliminating long delays between tows and most importantly allows the coach to be returned to the maintenance facility for repair and speedily returned to service. The tow unit is easily rolled into position for attachment by only one person. Its Tee-Bar caster system is designed such that it is evenly balanced for a one-man operation for moving tow bar to the attachment position. Once the tow bar is in position for hook-up sliding attachment sleeves allow the position of the eyehooks to be easily connected. The UTB-1000 is also ideally suited for towing vehicles within maintenance yards. Its fast hookup time means time saving to move coaches within maintenance yards especially when different maintenance operations are necessary. BCW warrants UTB-1000 for 1 year. The tow bar is evenly balanced which allows for one-man operation. This also minimizes potential injuries to towing personnel. A high strength Pintle hook is utilized for secure hook-ups to towing vehicle. A Dampening mechanism is also incorporated into the design which minimizes shock loads when stopping and starting during towing operation. The tow bar is designed to attach to the coach's manufacturer tow eyes and as such are capable of safely meeting high shock loads. 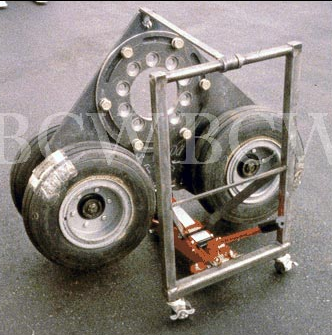 The BCW towing dolly for articulated buses provides a means for retrieving Articulated Buses which have sustained a frozen or damaged drive axle. When such a situation occurs the tow operator simply removes the dual wheel and bolts the dolly directly to the drive hub. The disabled bus can then be flat towed to a repair facility without acquiring additional extensive damage to drive components. The unit is rated at 16,000 lbs. and is equipped with four 8 ply aircraft rated tires. An optional dolly for supporting the tow dolly during placement for service is available. BCW warrants ATD-1005 for 1 year. 8 ply aircraft tires rated at 4000 lbs. per tire. Optional adaptors available for various bus models. Ruggedly constructed and quality welded for safety, strength and durability. If you're in need of made-to-order towing equipment that is customized for your unique needs and specifications, or if you want to buy what you see here, contact us for more info and a quote.